Sunday evening will don yet another Super Bowl with a cast of veterans at marquee positions as Super Bowl LII kicks off between the New England Patriots and Philadelphia Eagles. That doesn’t mean, however, that we won’t see some of the more youthful players making an impact in Super Bowl LII though – whether it be a positive or negative impact remains to be seen. In this preview, we examine possible first- or second-year players who could be difference makers on Sunday. Despite a crowded backfield, Clement has carved out a role for himself as a pass-catcher. Clement has caught all six of his targets so far this postseason, and his 71.2 receiving grade this year currently ranks 26th among running backs. Clement could also factor in this one as a kick returner. Even though he’s only returned three kicks this season, one of those was a 22-yard return against the Falcons in the Divisional Round. 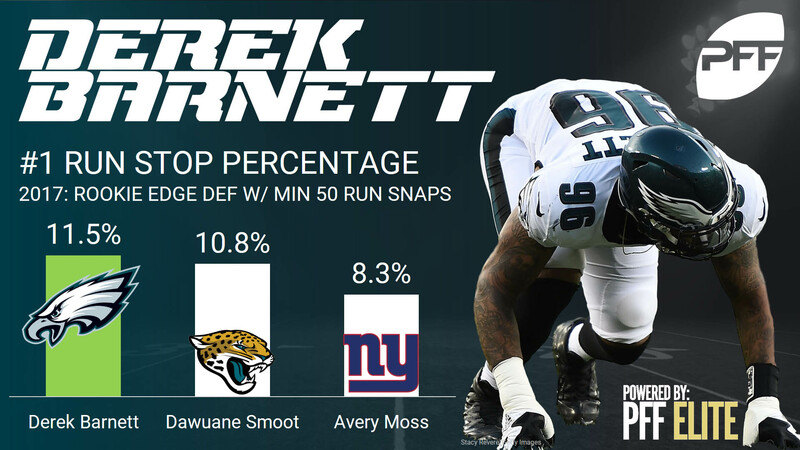 Barnett had his best games as a rookie in the second half of 2017. It wouldn’t be a shock if the 14th overall pick has his most impactful game yet against the Patriots. Barnett ranks 57th among edge defenders in terms of overall grade and comes into the Super Bowl with average-to-above-average grades as both a pass-rusher and run-defender. Barnett’s 37 total pressures this season tied Myles Garrett for the third-most among rookie edge defenders, and his 11.5 run-stop percentage ranked first among rookies with at least 50 snaps in run defense. Douglas currently ranks 88th among cornerbacks with a 61.2 overall grade, but he did show a penchant this season for getting his hands on the football. Douglas picked off two passes as a rookie to go with seven additional pass breakups, and his 15.5 playmaker index (interceptions combined with pass breakups divided by targets) ranks 25th among corners. However, Douglas has yet to see a defensive snap in the playoffs. There’s a very good chance that the most impactful rookie or sophomore in this game is Philadelphia’s rookie kicker. Elliott is 18-of-20 this season on field goals of at least 40 yards, and he’s currently our 10th-highest graded kicker for the season among the 33 kickers who’ve played in at least 10 games. Mills ranked dead last among cornerbacks in 2016 with an abysmal 31.8 overall grade. Fast forward a year later and as an NFL sophomore, he graded right in the middle of the pack. He heads into Super Bowl Sunday ranked 58th among corners with a 77.3 overall grade. 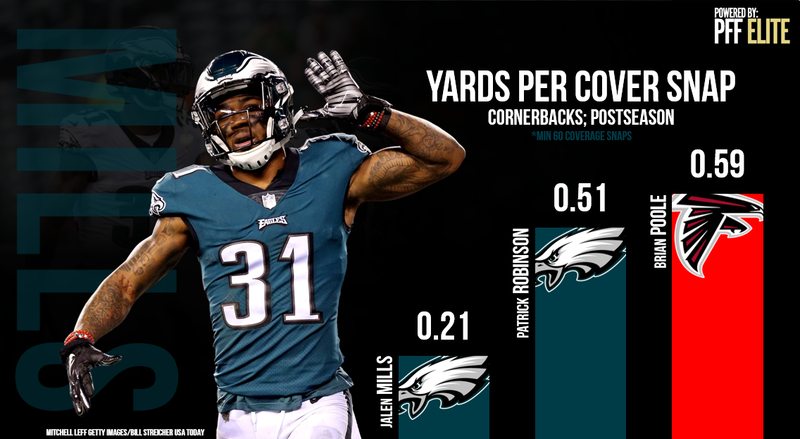 Mills was one of the better cornerbacks in football this season when it came to limiting a receiver’s production on a reception, and his 15 coverage stops were the 13th-most among cornerbacks. So far this postseason, he has allowed a league-low 0.21 yards per snap he’s spent in coverage as well. Vaitai heads into Super Bowl LII ranked 72nd among 83 qualified tackles in terms of overall grade, with grades below 50.0 as both a run-blocker (48.9) and as a pass-protector (38.0). Although he’s still been far from great, Vaitai has played some of his best football of the season lately. Even though the second-year tackle has finished just five games this season with an overall grade of at least 65.0, three of those have come in his last four games. All told, the Eagles have the best offensive line in football. If Vaitai can at least maintain that average level of play this Sunday, they could carry this offense to the Lombardi Trophy. Thuney ranks 13th among guards this season with a 79.3 overall grade, a nice improvement over the 53.6 overall grade he posted as a rookie in 2016. He ranks in the top-20 among guards in both run-blocking (78.6) and pass-blocking (78.7) grades, and he’s graded higher than 75.0 as a pass-blocker in each of his last four games. Thuney will have his hands full with a deep Eagles defensive line, but his grades this year indicate he should be up to the task. Lee didn’t see a snap prior to Week 12, but since then, he’s been on the field for at least 20 snaps in every game, including 36 against the Jaguars in the conference championship. The second-year player had at least one pressure in every regular season game he played in, but he’s yet to register one this postseason. Nick Foles has a 64.2 passer rating when under pressure this season against a 109.9 passer rating from a clean pocket. Sunday would be the perfect time for Lee to rediscover that pass-rush mojo. Roberts ranks 69th out of 86 qualified linebackers this season in terms of overall grade. The second-year linebacker has particularly struggled to make plays in run defense, as his 6.2 run-stop percentage ranks 78th among linebackers. Roberts had one of his best games of the season against the Titans in the Divisional Round, where he earned a 75.8 overall grade to go with grades north of 70.0 in both coverage and run defense. His highest game grade this season of 81.0 came in Week 2, so you might be disappointed if you’re hoping for an MVP-esque showing out of him in the Super Bowl, but a repeat of that Divisional Round performance could certainly happen – he’s finished six games this season with a grade of at least 70.0. One of two rookies to see significant playing time for the Patriots this season, Butler heads into the Super Bowl ranked 107th among 122 qualified interior defenders with a 52.0 overall grade. Butler has struggled to produce as a run-stopper as a rookie, as his 4.6 run-stop percentage ranks 115th among interior defenders. However, he has recorded a stop in each of the last two games. If Butler makes an impact play against the Eagles, chances are it will be with his pass-rush. He has 24 total pressures that led all rookie interior defenders, and he saw eight games this season (including the Divisional Round) where he recorded multiple pressures. Wise ranks 95th out of 106 qualified edge defenders in terms of overall grade, but he’s had his moments as a rookie with his pass-rushing. The fourth-round pick has finished 11 games this season with multiple pressures, and his 36 total pressures this season were the fifth-most by a rookie edge defender.